The oldest tree in the world is Methuselah, a bristlecone pine located in California's Inyo National Forest south of Kings Canyon National Park and east of Death Valley National Park. In 2012, its age was measured as 4,843 years. General Sherman, a sequoia in Sequoia National Park is the largest tree in the world by volume. Hyperion, also a sequoia, was discovered in 2006 in a parcel of land recently purchased by Jedediah Smith Redwoods State Park. It is the tallest tree in the world at just over 379 feet. Its exact location has not been disclosed in order to protect it and its environment. The second and third tallest trees, Helios and Icarus, are also located here. In fact, the ten tallest trees are located here in what is called the Grove of Titans. 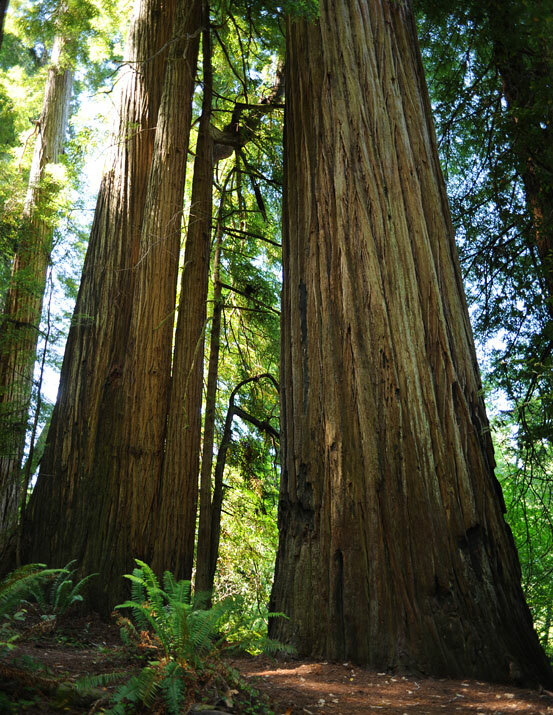 Scenes from several films were shot among the sequoias, including "Return of the Jedi" in Jedediah Smith Redwoods State Park and "The Lost World - Jurassic Park" in Fern Canyon, Patrick's Point State Park, and Prairie Creek Redwoods. Many people refer to these big trees simply as sequoia or redwood, but there are three types that thrive in two different environments. The giant sequoia thrives in high altitudes along the Sierra Nevada Mountains. Giant redwoods grow naturally only along the narrow coastal belt from San Francisco into southern Oregon. They are all of the genus sequoia. Redwoods can live as long as 2,000 years - sequoias up to 3,200 years. The sequoia tree is the tallest known tree. The massive height of dense groves creates an other-worldly environment below, shaded most of the time, with sound muffled by carpets of needles, and interspersed with lush groups of ferns and velvety green moss and lichen. There is an abundance of wildlife here, including Coho and Chinook salmon, one of the favorite foods for another resident - the black bear. There are bald eagles and spotted owls, bobcats and foxes, elk and mule deer. 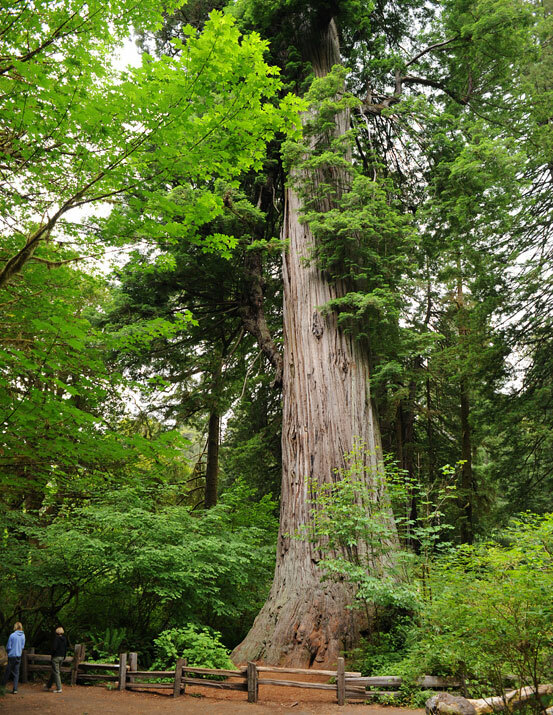 Many of the parks and forests containing these giant trees are accessible by vehicles and on easy loop foot trails. There are even three trees that are privately owned and have roads running right through them (fee charged). One of these trees, the Shrine Drive-Thru Tree near Humboldt Redwoods State Park, has a gift shop, picnic area, and a two-story tree house for the children. The parks are large and include a variety of ecosystems from coastal water with seal colonies to alpine meadows. There is a great deal of back-country area here for campers and hikers, and plenty of groomed trails. Hiking and camping are two of the most popular things to do in the redwoods national and state parks and forests. The beautiful Jedediah Smith Redwoods State Park is the most undeveloped and pristine of all the parks containing old growth redwoods and sequoias. This has both positive and negative impact on those wishing to explore. There are no trails at all in most of the park, which protects the undisclosed location of the Grove of Titans, containing the ten tallest trees in the world. It is located in the far northern part of California near the town of Crescent City and the Oregon border. This scenic trail is located on the western edge of Jedediah Smith State Park, near the park's only established campground. Access is available only during the summer. While this loop trail is not very long (only a half mile), it is quite possibly the most scenic trail in the entire coastal stretch of redwoods. If the scenery is familiar to you, it is because this is the location of the fictional planet Endor in the Star Wars film "Return of the Jedi." All the trees here are redwoods, with no understory of other tree species because the periodic flooding by the Smith River inhibits their growth. The ferns can be waist high or higher. Located along the coastline south of Crescent City, this park has an extensive network (75 miles) of trails. It offers a variety of landscapes and features, including beaches (great for whale watching in season), old growth forest (45% of all the old growth forest in California) and lovely Elk Prairie. This is a grassy meadow where you can often see Roosevelt elk grazing peacefully. In addition to the extensive network of trails, there are a number of campgrounds and picnic sites. In spite of the development here, this is still a remarkably pristine park and a designated World Heritage Site and Biosphere Reserve. Located in Prairie Creek State Park, the Big Tree Trail is a 3.2 mile loop trail that climbs 190 feet. It is quite accessible, as it starts at the park headquarters. The trail is lined with some of the tallest trees in the park, and crosses the course of the creek for which the park was named. There is dense vegetation along several stretches of the trails, including stands of tall ferns, maple trees draped with lichen, and moss-covered rocks. The highlight of the trail is the Big Tree Area, which contains a stand of very tall old growth trees, including the Big Tree itself. Unless you accidentally stumble across the undisclosed location of Atlas Grove, these are the largest trees you will see in the park. If you want a hike longer than 3.2 miles, Big Tree Trail provides access to several other trails, including Cathedral Trees Trail and Foothill Trail. Two highways parallel California's coast. The longest is historic Highway 101, which stretches from Los Angeles almost to Oregon, passing through redwoods country north of San Francisco. 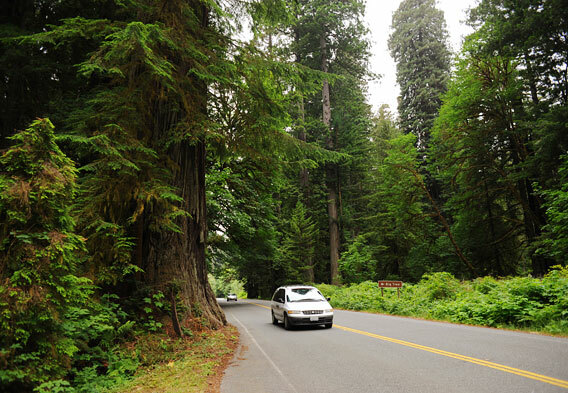 The scenic route traverses Humboldt Redwoods State Park and Redwood National and State Parks. Whereas Highway 101 has large sections that turn inland, shorter Route 1 (known as the Pacific Coast Highway) hugs the coastline for most of its length from Orange County to Leggett on the northern border of Mendocino County. It's famous for its breathtaking coastal views of Big Sur and views of the beautiful Mendocino coastline. If you're visiting San Francisco and don't have time to visit the larger parks in the north, there are ten beautiful state parks, national monuments, and reserves that can be accessed as day tours from the city. These include Muir Woods, named for the Scottish naturalist (died 1914) who was among the first to advocate for preserving California's forests and co-founded the Sierra Club. Many of these small parks provide coastal access and wonderful views of San Francisco. There are also sequoia stands in southern California, especially Sequoia and Kings Canyon National Park, located in the eastern part of the state about halfway between Los Angeles and San Francisco. There are more than 800 miles of trails in this area, as well as plenty of camping areas and other lodging. There are high peaks and ski resorts, great groves of sequoias and sparkling waterfalls, beautiful mountain meadows and lakes, and a plethora of wildlife. Here you will find General Sherman, a sequoia that is the largest tree in the world by volume.